Air filters come in all shapes, sizes, designs, and filtration levels. So, with that many options to choose from, how do you know which type of air filter is right for your home? Let’s start with the basics. 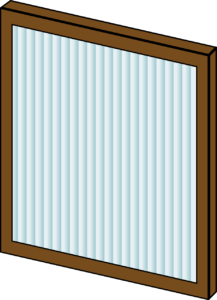 Air filters can be square or rectangular in shape. To measure the size of your air filter, first measure the length and width (L x W) of your air filter, putting the smallest measurement first. Next, measure the thickness of your filter. Your final measurement should read as L x W x D with the middle number being the largest of the three (assuming your filter is not a square). The four main types of air filters are fiberglass filters, pleated filters, disposable electrostatic filters, and washable electrostatic filters, all of which perform differently. Fiberglass filters are the most common type of filter. They are often flat, blue filters that are composed of a thin fiberglass fabric. These filters are designed to protect your HVAC system from large debris, rather than to improve your indoor air quality. Because they only remove less than 10% of indoor air pollutants, they are not the best choice for improving your air quality or protecting against allergens. Pleated filters are made up of folded sheets of cotton or polyester-blend fabric. They are folded accordion-style to increase the surface area of the fabric as well as aid in the passing of air through the filter. Therefore, as the number of pleats increase, filtration and indoor air quality are increased as well. Pleated filters are effective at removing up to 45% of air pollutants from your home and are therefore one of the best choices for home filters. Disposable electrostatic filters contain multiple layers of polyester blend materials, which are framed by a polyester mesh. This combination creates a static charge, which allows electrostatic filters to remove a large number of irritants and debris. While electrostatic filters are very effective at trapping mold, pollen, and allergens, they are usually much more expensive than other types of filters. Electrostatic filters are recommended for those with chronic respiratory ailments, such as smokers and those with allergies and/or asthma. Washable electrostatic filters are up to 10 times more efficient than standard filters, although they require a little more maintenance and work. These filters work similarly to disposable electrostatic filters, but contain a heavy duty aluminum frame rather than polyester mesh. While washable electrostatic filters are capable of trapping up to 94% of dust and allergens, they are the most expensive of all filter types. However, with proper cleaning every 3 months, these filters can last up to 5 years. Because indoor air pollution ranks among the top 5 environmental health risks, it is important that you select the best air filter to decrease your chances of airborne illnesses. It is not always necessary to choose the highest filtration level without cause for doing so. If you would like assistance in assessing your air quality needs, General Air is fully equipped to provide accurate assessments and recommendations, with full-service technicians to meet your repair or replacement needs. It is important to get your unit checked as soon as you notice a problem, so do not hesitate to contact General Air to get your heating and air systems operating smoothly again in no time. previous post: What Is The Best Air Conditioner Size For My Home? next post: What Is MERV Rating?